In some ways, Sky-Byte is one of the central characters on the show. All he wants is for Megatron to see him as the loyal and dependable warrior that he really is, and he goes to great lengths to prove his resourcefulness to him. 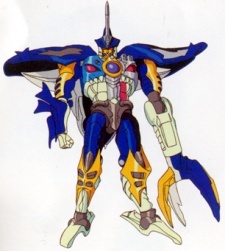 Although heralded as one of the mightiest Predacon warriors, Sky-Byte has summarily failed to live up to his hype during Megatron's campaign on Earth. Unfortunately for Sky-Byte, things seldom turn out as he has planned them - if it isn't the Autobots who thwart his plans, it is the three fools he has under him. And then there's the new threat, Scourge; that ingratiating newcomer who tries to assume his place as Megatron's second-in-command.